While the turkey is roasting, I cooked the Greens. Greens is a must for us, when we have turkey, they just go so well together. 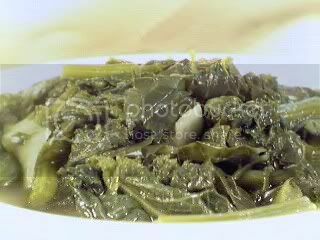 Greens is a typical southern dish, and most would not dream of mixing the type of greens together, but I find the flavor of mixed greens quite good so I usually mix collards, mustard, and turnip greens together. They didn’t have turnip greens at the market this week though, so for this version I only used collards and turnip greens. The most important thing about cooking greens is washing them. They tend to have a bit of dirt and sand still stuck to them, so if you don’t like gritty greens, wash them thoroughly. I usually put them in a basin full of water and slosh them around to loosen the dirt, then repeat until there is no sediment at the bottom of the basin. Greens can be cooked just by themselves, of course, but this being the south, it wouldn’t be quite right if it didn’t have a piece of smoked pork in it. Most people use smoked ham hocks, but I prefer to use pieces of Virginia Country Ham. At most groceries here, they also sell smoked turkey which is what some people use especially if they are not into pork. To start, boil the smoked meat in about 4 cups of water in a large pot. Boil the meat while you are preparing the greens to give it a head start in getting tender and flavoring the broth. Many southern cooks don’t add garlic and onions to their greens, but I do. So I put two cloves of garlic and 1/2 of a chopped onion to the boiling water. After washing the greens, it’s time to trim them. For the mustard greens, all you have to do is to cut the ends off (stalk end) and cut up the leaves in one inch strips. For the collard greens, I take off the stalk completely and just keep the leafy portion, also cut into one inch strips. Add the greens to the pot, and simmer until tender. When the greens are tender, (after about 30 minutes) adjust the saltiness by adding more salt if needed. Add about a teaspoon of red pepper flakes, and two tablespoons of cider vinegar and simmer for an additional 10 minutes. Stir, and check the seasonings again and adjust as necessary.